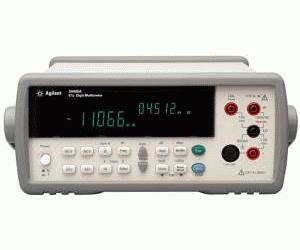 The NEW Agilent 34405A 5.5 digit benchtop digital multimeter provides more capabilities at a value price. The 34405A comes with a broad range of measurement functions, including temperature and capacitance measurements. The 34405A features simultaneous reading of DC and AC measurements with its dual display and can take up to 19 readings/sec at 4.5 digits resolution through the standard USB interface. The SCPI language compatibility makes it easy to migrate from your existing test setup.